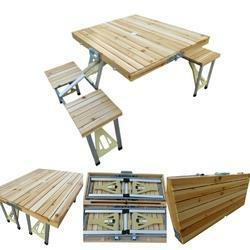 Prominent & Leading Manufacturer from Surat, we offer folding picnic table-wooden top - 8827, folding picnic table - 8828, folding picnic table-wood finish top, folding picnic table-green finish top, folding picnic table-4 side chairs and folding picnic table-120-separate chairs-blue. Size: Table Top : 85 x 72.5 x 68 Cm.Height. Seat - 27.5 x 29 x 41 Cm., OPEN - 138 x 81 x 68 Cm Height, CLOSED - 85.5 x 11 x 37 Cm Height. Weight - 8 Kg. 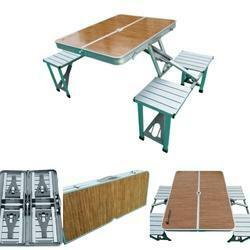 Picnic Table is made of Main Frame- Aluminium alloy metal with Wooden Top. Provided with 4 inbuilt chairs as integral part of a table capable to withstand weight up to 120 Kg on each chair. Table is fully collapsible and folding. Also, can be converted into a bag shape for easy carrying while travel. 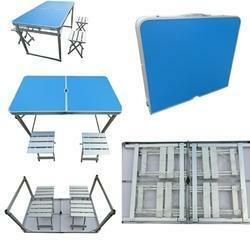 Specifications: Gross Weight of Table - 8 Kg Size of Table Top - 85 cm x 72.5 x 68 cm.Height. Size: Table Top : 86 x 67 x 69 Cm.Ht. Seat Height - 40 Cm. Weight - 10 Kg. Size 85 x 72 x 68 Cm.Height. Dimensions : Table Top : 85 x 72 x 68 Cm.Height. Seat - 27.5 x 29 x 41 Cm., OVERALL DIMENSIONS OPEN - 138 x 81 x 68 Cm Height, CLOSED - 85.5 x 11 x 37 Cm Height. Weight - 9 Kg. 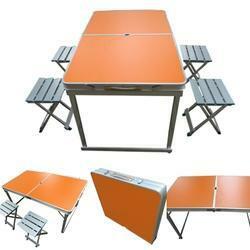 Picnic Table is made of Main Frame- Aluminium alloy metal with Wooden Top. Provided with 4 inbuilt chairs as integral part of a table capable to withstand weight up to 120 Kg on each chair. Table is fully collapsible and folding. Also, can be converted into a bag shape for easy carrying while travel. 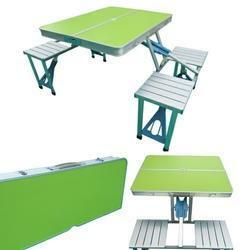 Specifications: Gross Weight of Table - 9 Kg Size of Table Top - 85 cm x 72 x 68 cm.Height. Size: Table Top : 95 x 80 x 71 Cm.Ht. Seat - 29 x 27 x 41 Cm., OPEN - 95 x 80 x 71 Cm Height, CLOSED - 80 x 10 x 48.5 Cm Height. Weight - 11 Kg. 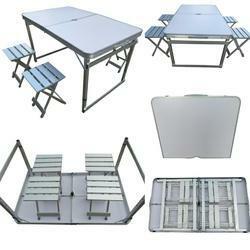 Picnic Table is made of Aluminium alloy metal. Provided with 4 inbuilt chairs as integral part of a table - single chair on each side of a table, capable to withstand weight up to 120 Kg on each chair. Table is fully collapsible and folding. Also, can be converted into a bag shape for easy carrying while travel. 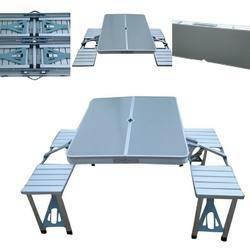 Specifications: Gross Weight of Table - 11 Kg Size of Table Top - 95 cm x 80 cm.